I was depressed today. I'm not gonna sugar coat it. I've been in & out of depression going on 4 years now. Extreme highs & dangerous lows with constant anxiety nipping at my heels. This is okay. I don't blog to relieve my problems, I blog when I am inspired. So please, read on. I just spent a lovely weekend in Pottsville, seeing my nieces, nephews, pregnant sister & newest brother-in-law. Their amazing beach house was filled with big belly laughs, constant chatter & a feeling of life. On the way there it was freeing to be driving with the windows down, singing at the top of my lungs (partly to drown out the horrific crackle of my very worn-out speakers). Walking along the beach, greeting passers by & feeling pure happiness just watching the other beach-goers enjoy some simple pleasures - horse-riding, fishing, playing fetch with their dogs. I could have spent eternity on that beach. It wasn't until I got home, exhausted & sunburt, I crashed out on my couch. Waking up from a dreamless sleep I found my self in the dark, alone with anxiety creeping through the cracks. It's not the first time & I'm sure it won't be the last. I made myself hot drinks, chatted to my friends & got through until I found sleep again. Suddenly, it was time to get ready for work. But this time my sleep hadn't been without dreams & they were not pleasant. My dreams have always been pretty intense, keeping me awake through the night for months at a time. They increase my anxiety on a regular basis but since getting my new dream-catcher I haven't been having any issues at all. Whether our old friends the Indians were onto something or simply by the power of my mind, it had worked for a while. Not today. The dreams had me overcome with panic. Waking up & remembering a dream is one thing, waking up amid one already lost in tears & fear is another. My panicked crying is a pretty shoddy sight to be had, I'm sure. I can barely breathe, there is no control or level of dignity. I tried to shake it off, get up & move on. No dice. Shamefully I didn't have the willpower or the care. I gave up. I stayed that way until 11:30 in the morning. It took me all those hours to find a way out of bed. I numbly went about doing housework, trying to make some use of myself, hoping I'd feel better. A load of washing. A load of dishes. Couch. More tears, more fear, complete helplessness. I talked to a friend. I felt no better. Into a hot shower with a bottle of wine I went. It's hard to admit that I gave in. I never want to feel the low. It's unimaginably horrible. But after all these years I know I am the only one who can fight back. No matter how much support, no matter how many times I fall, I am the only one who can truly help myself. All of you out there who know it will understand. Depression is not something we choose. It's certainly not something we want to feel. It's suffocating, all consuming & sometimes although we fight, it wins us over for a time. With nothing but a chuppa-chup & half a cup of warm Milo in my belly all day, I knew the depression was starting to slip away when I suddenly felt hungry. Problem: I have just about nothing to eat in my house at the moment. No milk, bread or eggs... no, you know, food. The nearest food was at the servo. Sorry, I refuse to pay triple the price for grocery items nor go out in to the cold for them. Digging time. Butter. Flour. Sugar... Milo: Inspiration. I don't measure when I cook anymore. I'm a 'roundabout that much' kinda lass. Consistency & taste tests are the best. So sorry guys, no recipe for this. 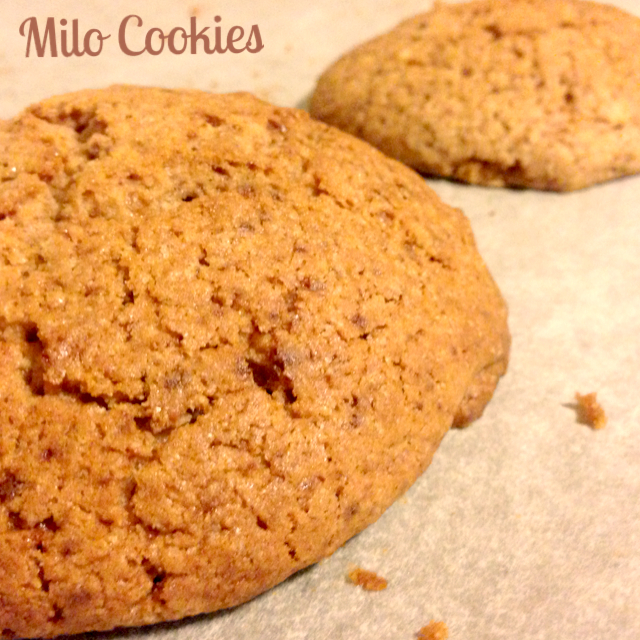 And here you have them... Milo Cookies. My most yummy spur-of-the-moment creation yet. One of the smallest things to happen in my day yet the biggest combatant of my disabling depression.